This CD opens with Mendelessohn's (1809-1847) prelude and fuga in C minor Op. 37. The severity in the fuga reveals the solid counterpoints skills owned who managed to bring back to apogee J.S. Bach's music. This is forerun by emphasised violins hints within the moving prelude. The fervent farewell to J. Brahms's (1833-1897) life and music is here portrayed from well-known 'preludio al corale' 'Herzlich tut mich verlangen' N.10, from choral preludes 122, written in the very last years of Hamburg composer's life. Shuman's “Symphony Sketches” (1810-1856) draw inspiration from the “piano with foot pedals” instrument used to practice by pipeorgans players at thath time. The pleasant results of these preconditions descend clearly from piano frameworks, which find complete fulfilment in the "king of musical instruments", great variety of tones and textures. Liechtenstein born Josef Gabriel Rheinberger (1839-1901) was a highly prolific composer. Nowadays he is remembered mostly for his remarkable pipe-organ works and in particular for his twenty “Sonate”. From the 11th sonata is drawn the mellow Cantilène, sweet melody entrusted to oboe tones. Sigfrid Karg-Elert (1877-1933) was active both as performer and teacher and he developed a well pronounced impressionist musical style. His appellative “pipe-organ Debussy” hail from his music seductive shades and courageous modulations. The powerful and triumphal march “Nun danket alle Gott” op. 65 is one of his most famous and well achieved compositions. 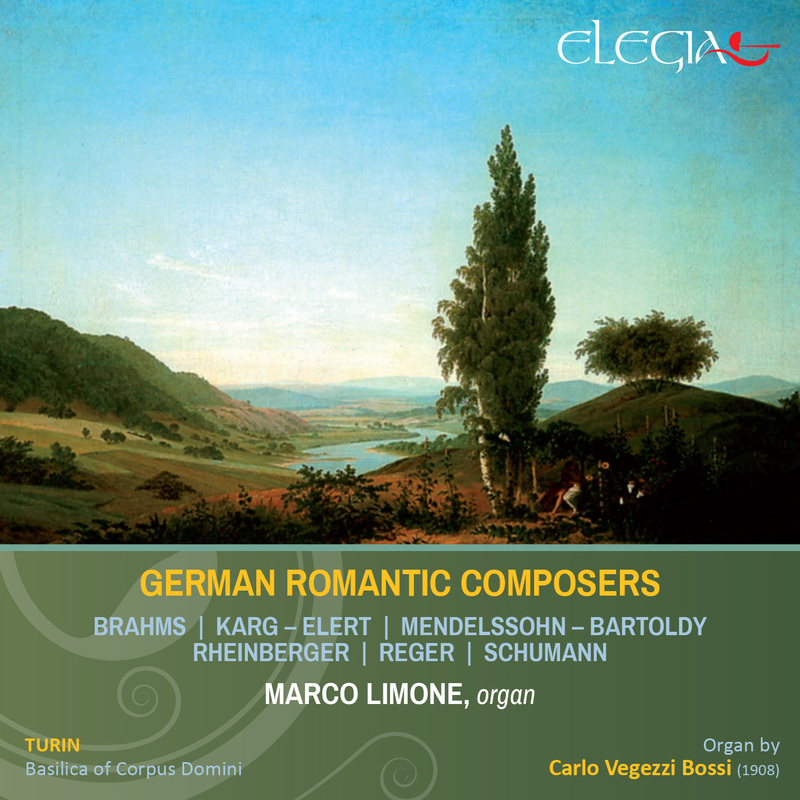 The conclusion of this collection, consecrated to German Romanticism, couldn't miss to homage the great Max Reger (1873-1916) here represented from the sinuous and stunning Melodia op.59 N. 11 and from the powerful Improvisation from Sonata opera 60 in D minor.